I didn’t have much to do this weekend so I decided to play around with some nail art. I did a few different things using China Glaze For Audrey as the base. For some reason I’m really into this shade right now. Actually, I’m always into this shade, it’s one of my very favorites ever. But the color isn’t just a pretty Tiffany blue, it’s also kind of winter-y and holiday-ish somehow. So today I’ve got a dot mani using For Audrey as the base and then China Glaze Snow and Concrete Catwalk as the dots. I love this color combo – especially the blue and grey together. All are thick opaque polishes, so they play nicely together. Apply two coats of For Audrey and let dry about 10 minutes. Use the larger end of the dotting tool (or a larger dotting tool) and apply Concrete Catwalk. Use the smaller end of the tool (or a small dotting tool) and apply Snow. Add top coat and fin! Still working on my dotting technique and placement, but it’s not too bad I don’t think. What do you think about this color combo? How do you like to wear For Audrey? 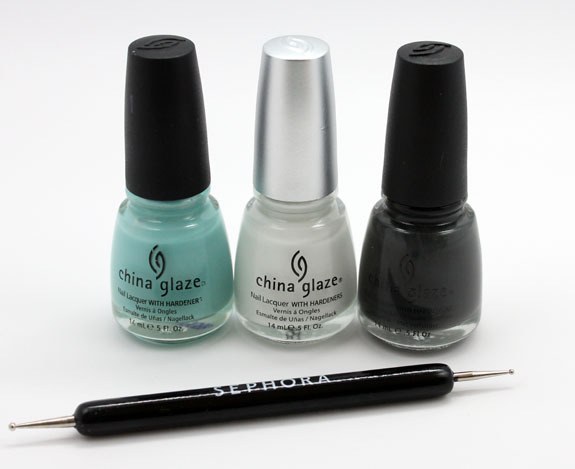 Note: China Glaze is cruelty free. This is cute! I have a dotting tool, but I’ve never actually used it . . . I really should, soon! Very nice! Reminded me a bit of a faux French. So cute! I love For Audrey but I just gave mine to someone… I need to replace it! I like For Audrey a lot!!! Love this, totally gorgeous color combo! 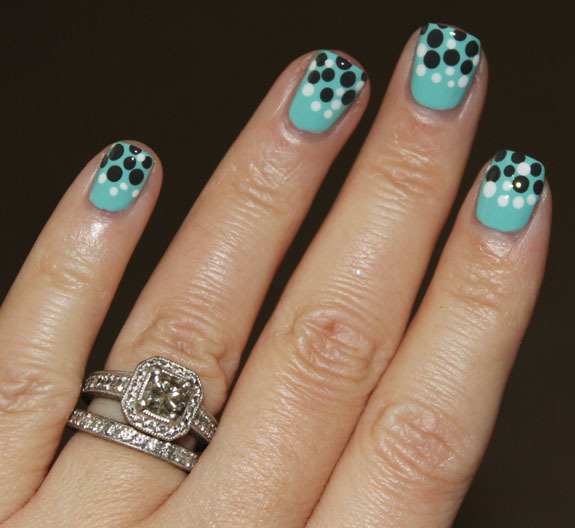 One thing that works better for me is to do dotting a little bit differently than Kelly did with her For Audrey dot manicure. I don’t let the polish dry before adding the dots. For me, it helps the dots to collapse into the other layers of polish, rather than mounding on top, if that makes sense. I also just paint the dotting tool instead of placing it into a puddle of of polish, so that I can get the right amount of polish on the dotting tool, not too little, not too much. I was just playing with For Audrey yesterday, making a franken shade by mixing it with a white shimmer polish. It is gorgeous in all its creamy glory in your dot manicure too. Very cute. I bought For Audrey after seeing it on here quite some time ago. Very pretty shade. I also have a dotting tool I have never used. I am to afraid that I won’t be able to make my right hand look as nice as my left! I really like seeing your cute dotticures, Kelly! 🙂 Looks like you’re having a lot of fun! 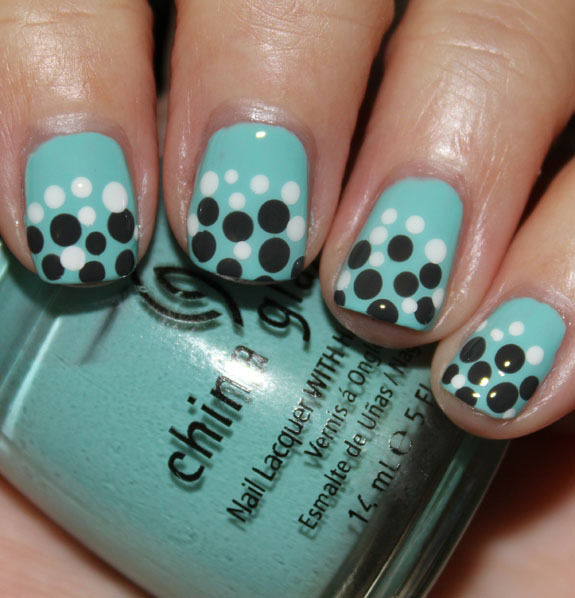 Fantastic combination of colours for a dotticure- I love this look! Oooh that turned out so cute!